If there is anything that I’ve learned since starting M$M, it’s that credit cards are a SUPER divisive topic. Some of my readers hate them, while others love using credit cards for travel hacking. In my opinion, as long as you’re responsible and have your finances in order – they aren’t so bad (assuming you pay the entire balance each month). Imagine booking a perfect international vacation to your dream destination. First class flights, airport lounges, luxury hotels, and more can add up to an unforgettable experience for yourself and anyone else you might want to bring along. Now, imagine that your total out-of-pocket cost ends up being only a fraction of what you expected to pay. This was the reality for my wife and I when we took our 3-week honeymoon to New Zealand and Fiji for less than $400. If we would have booked the exact same business class flights and hotels with cash instead of miles and points, the total cost would have been nearly $14,000! This is a more extreme example, but almost anyone can use travel hacking and responsible credit card use for funding their travels. Today, I’m going to cover everything you need to know about travel hacking, from understanding your finances, finding the right travel hacking credit card, and how to use them to their fullest potential. These cards are appealing because they offer a large sign-up bonus, but they aren’t for everyone. It takes knowing how to use your credit cards responsibly in order to actually gain the benefits of travel hacking, and an organized person has the potential to churn their credit cards into a very lucrative side hustle. While this isn’t a prerequisite of travel hacking, basic organization is a must in personal finance, and it will ultimately help you with churning credit cards for travel hacking. You should have a system in place to pay all of your bills on time and in full. And, you need to be tracking various aspects of your financial picture in Excel or something similar. Staying organized with travel hacking is important to make sure you aren’t paying unnecessary fees or missing out on benefits, particularly if you decide to ramp up your usage or rate of opening new cards. We use a custom Excel sheet to track all of the credit cards we’ve opened (you can find a copy of my own credit card tracking sheet here). 2. Your credit score will be fine, I promise! The slightly longer answer is that a new account on your credit report, lower overall utilization, and additional on-time payments (all positives) more than offset the hard credit pull and lowered age of accounts (negatives) over the mid to long-term. In the short term, it is possible for your score to drop a small amount (typically less than 10 points), but it should recover within 3-12 months and keep growing beyond its starting point. Closing credit cards also won’t negatively impact your score so long as you maintain a low utilization rate across the cards that remain open. For a much longer answer with all of the nitty-gritty details, I recommend checking out this post dedicated to the subject: Churning: Tracking and Understanding Your Credit Score. Anecdotally, I can tell you that both my wife and I have gone from scores in the low 700s to the high 700s in just a few years. This is despite each of us opening (and closing) dozens of new credit cards during that time frame. Another anecdote is that we had no problem refinancing our mortgage or opening a HELOC, despite having opened several cards within months of applying for each respective loan. Credit scores are far and away the largest concern most people have, but I can assure you that the fear is largely unfounded. Before you open your first card dedicated to travel hacking, it’s important to do some research. There are a lot of travel rewards cards out there, and everyone has their favorites. When deciding on which card to choose, you will need to take a few things into consideration. Credit score- To get the best rewards, you will want to have a credit score of 700 or higher. Where you spend your money- Some cards give more points for certain spending categories, so check how different cards align with your spending to gain the most benefits. Know your goal- Do you plan on using your cards for airline miles, hotel stays, or cash perks. Some cards are better for airline travel than others, but that doesn’t mean you can’t open a card with a high cash back bonus for road trips. Airline or hotel specific cards- Every major airline and hotel chain has a card that offers brand specific perks, such as free upgrades, priority boarding, and free checked bags. If you typically book with one company versus another, airline or hotel specific cards might be the way to go. The sign-up bonus- Credit cards used for travel hacking have large sign-up bonuses to entice new customers. Compare the offers to determine which card’s sign-up bonus is best for you, plus be aware of their spending requirements. Annual fees- There are travel rewards cards with annual fees and some without. When finding the right card, see if the rewards outweigh the annual fees, many of which are waived during the first year. As I said above, there are a lot of different factors that will determine which travel rewards card you go with. While the cards listed below are some of the top picks for travel rewards, I’m listing them so you can see the subtle differences in some of the favorite travel rewards cards. Chase Sapphire Preferred Card– This card is a favorite because you can earn points in a variety of ways, plus it has some pretty incredible rewards. Sign up bonus- 50,000 bonus points when you spend $4,000 in the first three months of opening your account, which equals $625 in travel rewards when you book through Chase. How you earn points- 2x on travel, from airfare, hotels, taxis, and trains. 2x points on worldwide dining. 1 point on every $1 spent on all other purchases, but do check the offer details to understand these fully. Annual fee- $95 fee waived in the first year. Other benefits- In addition to the 50,000 bonus points, Chase offers a 1:1 rate on several other loyalty programs. Drawbacks- It doesn’t offer the loyalty perks, such as priority boarding or free checked bags, that airline specific cards offer. Bank of America Travel Rewards Card– With no annual fee and great rewards, this card is a top pick. Sign up bonus- 25,000 online bonus points when you spend $1,000 in the first three months, which equals $250 credit towards travel purchases. How you earn points- 1.5x points for every $1 you spend, and each point is worth 1 cent. Annual fee- $0 annual fee. Other benefits- You can book any season and with any carrier or chain, and there are even greater rewards if you are already a Bank of America customer. Drawbacks- Bigger spenders will lose rewards perks if they aren’t already a Bank of America customer. Capital One Venture Rewards Credit Card– This card is one of the best for earning overall flexible rewards. Sign up bonus- 50,000 miles when you spend $3,000 on purchases made in the first three months, which equals $500 in travel rewards. How you earn points- 2x miles on every purchase and 10x miles on thousands of hotel stays. Annual fee- $95 fee waived for the first year. Other benefits- Travel points can be used on everything, even $5 cab rides, making it one of the most flexible rewards cards. Drawbacks- You don’t gain the same travel perks as you would with most airline or hotel specific credit cards. Now, while these cards currently offer great perks for travel rewards, it’s important to do your own research to find which card is the best fit for you. The spending requirements, rewards points, and annual fees are all a little different, and those differences will help you find the best card. Also, know that the rewards these companies offer, as well as eligibility, can change. You’ll read more about this later. For anyone wanting to learn how to travel hack and getting excited about the potential rewards (or for those just thinking about starting), taking it slow is my #1 tip to make sure you don’t get in over your head. Or, if you’re anything like me, then you are probably going to feel a bit overwhelmed when you get started. That’s okay! Opening a credit card for travel hacking uses the same process as opening any other credit card, and you’ve probably already done that. There are a couple of things you need to understand before you decide on and apply for your first travel hacking credit card. These steps will take the stress out of travel hacking and ensure that you gain the most rewards. Find a place to keep track of your credit cards. Use it to pay for all of your normal purchases (this is likely how you will be able to meet the spending requirements needed to earn that bonus). Pay your balance every time you receive a statement. Check your statements to ensure that the rewards are posting to your account. Keep repeating steps 3-5 until you earn the rewards, and then the fun happens – actually use your rewards to book some travel. That’s why we’re doing this after all! The points and miles you’ve earned aren’t worth anything until you spend them. A good exercise whether you have immediate travel plans or not is to go through the process of booking with your newly earned points, even if you don’t check out. This will help you get comfortable with learning how to use your travel rewards in the future. The only thing left is to decide whether or not to keep the card open for the long term. Many travel rewards cards have annual fees, most of which are waived in the first year. But, you need to determine whether or not your travel rewards outweigh the annual fee. You can always see if you can downgrade to a different product before deciding to close the card. Once you’ve gotten past the hurdle of attempting your very first card, here’s another lesson going forward: Annual fees aren’t necessarily a bad thing. When I first started, one of my primary goals was to avoid paying ANY annual fees, and I avoided all cards that required an annual fee be paid in the first year. I suppose I was convinced I would outsmart the banks by avoiding “the catch” to the whole thing. In reality, the annual fee should be approached rationally, like anything else, and it should be compared to the benefit(s) received. Here’s a hypothetical example: Which card would you rather apply for? Card #1: $200 signup bonus after spending $2,000 with no annual fee. Card #2: $500 signup bonus after spending $2,000 with a $95 annual fee. If I was asked this question a few years ago, I probably would have chosen Card #1 because it appears to be the “risk free” option. Now, I understand that the rational choice will almost always be Card #2! Why would you do something for a profit of $200 if you could do the exact same thing for a net profit of $405? $550 annual fee (not waived for the first year). 60,000 Membership Rewards sign-up bonus after spending $5,000 within three months. $200 airline credit per calendar year (so $400 within the first year the card is open). $200 Uber credit in the first year. Plus elite hotel status, lounge access, a global entry credit, and more. A unique feature of this version of the Amex Platinum card is that points can be cashed out at a flat rate of 1.25 cents per point. That makes the sign-up bonus alone worth at least $800! Add in the $600+ of available credits during the first year with the many auxiliary benefits and $550 is starting to look like a steal. If you’re just opening your first rewards card, then I totally understand if you want to lower your perceived risk by avoiding an up-front annual fee. Just don’t stay in that habit for too long or you might miss some very lucrative opportunities. Despite recommending a few top picks for travel hacking credit cards as a way to see their differences, it’s important to know that the travel hacking game as a whole is constantly changing in several different ways. A good credit card today might end up being a poor choice tomorrow. In addition to changing their offers, the banks issuing the cards also change their eligibility rules from time to time. Even the various points and rewards you earn from the credit cards change in value and flexibility, so be sure to use your rewards rather than hoarding them. Overall, the state of travel hacking at any given time is in constant flux. Luckily, you don’t have to worry about keeping track of it all yourself because there are several great regularly maintained resources that aggregate this information for you, and you can read more on this below. The best way to gain and use your travel rewards is to start out by planning how you will reach those rewards. For many, this will include planning a large purchase or determining whether your spending habits warrant the card specific spending requirements. Use your card to pay for as much as possible, with the caveat that you will be able to pay the balance each month. I mentioned this in the beginning, but it’s a must with learning how to use credit cards for travel hacking. You should never incur more debt in an attempt to gain travel rewards. You will get the most rewards if you churn your credit cards and use your points for travel. Some of these cards will offer cashback or gift cards, but because most have deals with airlines or hotels, that’s where you will gain the most benefits. We haven’t talked much about airline specific cards, but if you prefer a specific airline, or already have accrued miles with a specific company, you may earn even more points using an airline specific credit card for travel hacking. We all travel a little differently. Some of us love the speed of airline travel, while others love traveling via the open road. Likewise, some of you may prefer staying with friends and family, AirBnb, or camping rather than staying in a hotel. If you aren’t the flying and hotel type of traveler, you can still be an expert travel hacker. Cashback cards offer the flexibility of traveling in the way that best fits your personal travel style. These cards operate in the same way, meaning you open them, meet spending requirements, earn your bonus, and use them for travel (whatever that may look like for you). The bottom line with travel hacking is finding which cards work best for you. While you should pay attention to the advice of others, you will always earn more in the long run if you find a card that aligns with your preferred spending and travel. Have you ever considered travel hacking before? Or, is it something you are staying away from? Any additional guidance in finding the best credit card? I’m curious what other folks have selected. Don’t do any offers that will give you less than a $500 reward. There are too many out there to worry about the $100-$200 rewards on the no annual fee cards. If it’s a card worth keeping see if they’ll waive the annual fee the following year. Some do, some don’t. The Chase branded credit cards have been very consistent in offering the best bang for your buck-If you have a great credit score, I recommend considering the Chase Sapphire Preferred or Chase Sapphire Reserve. Both cards do have an annual fee ($99 and $450, respectively) however the sign on bonuses and easy earning and redemption options far outweigh the fee. You can also transfer points to popular airline and hotel loyalty programs. There are way too many benefits for me to list here, but I hope this helps! My answer for “best” single credit card is a no annual fee 2%+ cash back card (like the Citi Doublecash) because it’s the simplest and cash is always easy to redeem. This is if you want to use a single card for all purchases for a long time. If you want to play the signup bonus game and keep switching cards, Chase is a great place to start with their Sapphire products. In general, if you want free domestic flights, pick a 50k+ bonus airline card that services your local airport. For hotels, Hyatt, IHG, SPG, and Hilton all have decent offerings, just make sure you’re getting the highest bonus available. If you want more exotic international flights in business/first class, collecting flexible points like Chase UR or Amex MR will give you the most options. Asking “What Credit card should I get?” is kind of like asking “What car should I get?”. A lot more information is needed to get a good answer, but hopefully this is helpful! My wife and I just started travel hacking last August and have already earned at least $4,000 towards future travel. My only regret is not starting sooner. We use the cards to pay for our normal expenses … nothing else. I think another important point for anyone new is to leverage your significant other if possible to earn rewards at the same time. Both my wife and I are earning rewards on cards just in our name and are taking advantage of the bigger bonuses right now. I agree on credit score too. This was my biggest worry about not starting. My score has dropped a few points since last August but fluctuates in the low 800’s within 10 points each month. Lastly, your suggestions for annual fee’s is right on target. At first I wanted to avoid any cards with immediate annual fee’s. But if you do the math, most of the time the bonuses are much higher than other cards and they more than pay for that annual fee. One thing moving forward that I would like to get a better understanding on though is strategies for closing out cards. I just created a tab on my budget sheet to track all the cards I’ve had, with the sign up date, fee, rate, limit, cancel by date of I don’t want to pay the fee again, and whether it’s open or closed. It comes in handy when I want to apply for a card like from Chase that has restrictions on how many accounts you’ve opened in the past two years. Agree on pretty much everything. My wife and I each stick to maximizing our regular spending and don’t get into the manufactured spending at all. Playing in “two-player” mode means you can double up on the best bonuses and turn “2 free night deals” into 4 nights easily. We do this on the Hyatt cards whenever possible for their all-inclusives. For closing cards, we close the vast majority after one year. No annual fee cards stay open (because why not) and a couple cards we pay the fee on (like the IHG card) because the annual benefit outweighs the fee (free hotel night for $49 in this case). Nice! It took a while to get family on board, but leading by example definitely helped! Now my parents and brother travel hack casually which has led to some awesome family trips. I’ve been thinking about travel hacking more and more so this post came at a great time for me! Really helpful information! I just mean to search for flights/hotels and see what they cost and how the booking process works. This means you can click all the way until the end, but not confirm or actually spend any points to get a feel for using points instead of cash. Definitely don’t book anything you don’t plan to use! It’s like adding something to your amazon cart but not actually checking out. This is totally optional, but a decent exercise if you’ve never booked anything with points/miles before. I love travel hacking, it has allowed me to book at least 2.5K in flights over the last couple of years for free. I vouch that my credit score has never suffered, and I typically keep cards for the full year with the annual fee waived. I call to try to get it waived (never works), then cancel the cards to open the next one. Great recap of the basics! I started travel hacking last April and have been really enjoying it. We haven’t gone crazy, but a couple Chase Sapphire Preferred cards and Southwest cards to get the Companion pass. It’s saved us hundreds of dollars on travel, with plenty of points still left to spend! Awesome! The Companion Pass is one of the best deals in travel hacking if you can get a good amount of use out of it. A good thing to do while traveling is to take pictures with your phone and upload them to your blog or website. This way, you can blog on location and stay connected in real time with your target audience. I’ve been reading your blog for a while and loving it and just found this post which is mainly what I do. I’ve been travel hacking for years and coach others. Glad to see you into it as well! Yeah we’ve started doing it, and it’s a lot of fun! 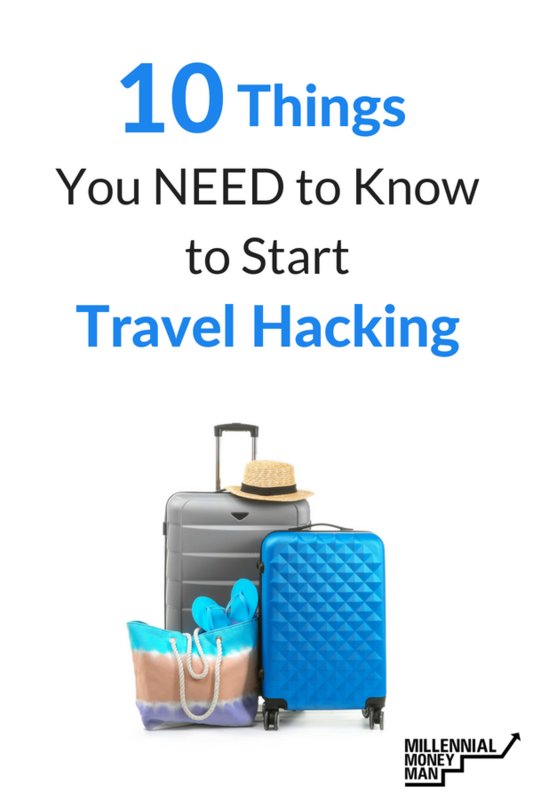 I’d love to get started with travel hacking, but find the whole thing to be super intimidating. I did too before we started! It’s freaking awesome though. We did a two week trip to Florida and used points to pay for most of it! I was just saying how much I sucked at travel hacking, and then you post this! Now I have to try again lol, I have a few trips coming up!